For the latest evidence that unaccountable tax breaks fail to promote investment for job creation, shop at Sears—while you still can. Gov. Pat Quinn’s signature had barely dried on the Illinois legislature’s lavish new tax-break deal to retain Sears Holding Corp.’s headquarters when the company announced store closures and layoffs. The deal, valued at up to $275 million in property and income tax breaks, was signed into law on December 16. Yet on December 27, the company announced that it would close between 100 and 120 Kmart and Sears stores. Cynically, we note that the initial list of 80 closures does not include any Illinois stores, nor have any headquarters layoffs been announced… yet. But with Sears still losing market share, and reporting another decline in same-store sales (down 5.2% late 2011 over late 2010), how safe can Illinois jobs be? We hate to say we told Illinois so. But as we forecast in our blog of last August: when a company is ailing and it asks for a tax break, the wisdom of the plant-closings movement tells us: tax avoidance can be one form of disinvestment, another early warning sign of job loss. Put another way: if a company doesn’t see a future in the community or the state, why should it keep investing in the schools or roads or universities? Indeed, inadequate reinvestment in Sears has been a major theme since hedge fund manager Eddie Lampert took control of the company. As the New York Times’ Floyd Norris pointed out in a December 29 column, between February 2005 and October 2011, Sears Holdings spent only $3.2 billion on capital expenditures (i.e., physical improvements) while taking $6.6 billion in depreciation charges (i.e., physical wearing-out). 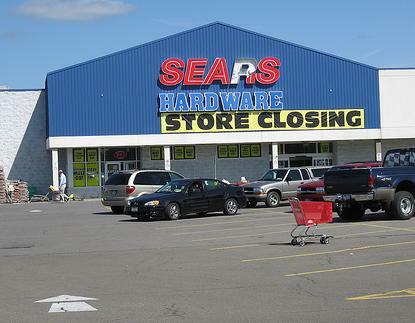 Instead of reinvesting, Sears Holdings is reportedly soon to allow some its prize jewels, such as Kenmore appliances and Craftsman tools, to be sold by other chains such as Costco and Ace Hardware. Won’t that just further reduce traffic into Sears and Kmarts? Meanwhile, Illinois taxpayers, after giving Sears a retention package worth about $178 million in 1989 when it threatened to run away, have pledged up to $275 million more after a second runaway threat. Small retailers in South Carolina must be asking themselves: if the enemy of my enemy is my friend, and then we win, and then my “friend” resumes life as another huge enemy, should taxpayers subsidize our demise? In an announcement that some called a political “payoff,” Wal-Mart and South Carolina Gov. Nikki Haley announced this week that the company will open dozens of new stores employing as many as 4,000 people in South Carolina over the next five years (of course, research suggests that Wal-Mart destroys 3 retail jobs for every 2 it “creates). It already has significant presence in the state with 74 stores, two distribution centers, and nine Sam’s Clubs. The announcement came just a week after the South Carolina House rejected a bill that would give the online retailer Amazon an exemption from collecting sales tax on the state’s residents (as part of a larger subsidy package). One of the active opponents to the Amazon deal was Wal-Mart. During the Amazon sales tax exemption debate, Wal-Mart, along with other big-box retailers, joined organizations representing small businesses in South Carolina to actively lobby against the deal. Besides its seven lobbyists pressing the House, Wal-Mart encouraged its South Carolina employees to communicate their opposition to state representatives. The retailer argued the Amazon exemption would be harmful and unfair to bricks-and-mortar stores. After the House rejected the deal, Amazon cancelled plans to open a distribution center in the state. Over the years, critics of Wal-Mart have pointed to the retailer’s low-wages, unaffordable benefits, lack of career paths for the majority of workers, contribution to sprawl, and anti-unionism. Some in South Carolina point out now that the same small retailers that Wal-Mart “partnered” with against Amazon will likely become Wal-Mart’s victims as it gains market share by opening more supercenters. Wal-Mart’s rhetoric on the Amazon deal was quite ironic. It argued that Amazon should not be granted sales tax exemption because it would give Amazon unfair advantage over other retailers. But Wal-Mart and developers who build for it are not shy about asking public officials for economic development subsidies that small retailers often consider an unfair advantage. In Shopping for Subsides: How Wal-Mart Uses Taxpayers Money to Finance Its Never-Ending Growth, Good Jobs First documented that the retailer benefitted from $1 billion in such subsidies (later updated to $1.2 billion) from state and local governments. In South Carolina, for example, Wal-Mart enjoyed a $10 million deal from the City of North Charleston for infrastructure improvements at its supercenter, and a distribution center in Pageland got a deal worth of $28.2 million in various subsides. 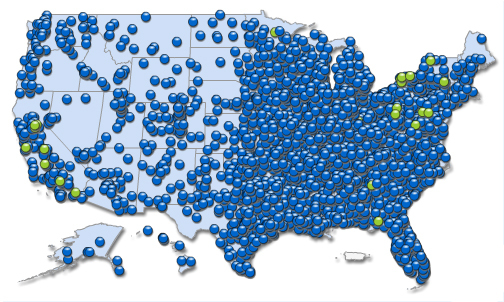 (For a national compilation of such deals, see Good Jobs First’s Wal-Mart Subsidy Watch webpage). Will locally owned retailers now remind Wal-Mart and elected officials about unfair advantage, whether it applies to Amazon or Wal-Mart? Or will the enemy of their enemy cash in as South Carolina subsidizes Wal-Mart’s new facilities? Xanadu, an "offense to the eyes." According to a new report released last week by New Jersey Policy Perspective (NJPP), a nonpartisan policy research center based in Trenton, Gov. 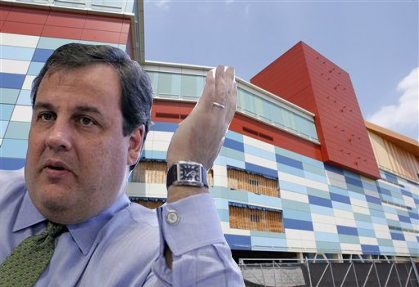 Christie’s administration has awarded $822 million in economic development subsidies in its first 15 months in office. A Surge in Subsidies documents the recent torrent of tax credit and grants awarded by the Economic Development Authority at a time when the state is slashing budget items for education, health, and social services. NJPP examined just four of the state’s many economic development subsidy programs. The controversial Business Employment Incentive Program redirects the personal income tax withholding of employees to participating businesses. The recently enacted Economic Redevelopment and Growth Grant (ERG) program has been used to approve awards totaling an astounding $351 million in diverted tax increments to New Jersey companies since February of 2010. Once laudable for its geographic targeting, the Urban Transit Hub Tax Credit is now used so extensively that it is poised to become a major revenue drain for the state. Despite abundant criticism of recent deals such as the state’s decision to bail out a casino owned by Morgan Stanley ($261 million through ERG) and $101 million to relocate Panasonic’s North American headquarters just eight miles, New Jersey continues to dole out major subsidies. Gov. Christie once called the stalled Xanadu mall project “an offense to the eyes as you drive up the turnpike.” Now, he favors a $200 million tax break to rescue the project. The Colorado Senate is evaluating a risky new development subsidy proposal that passed in the House last week. House Bill 1220 would, for the first time, allow the diversion of incremental state sales tax revenues to back bonds used to finance road construction for new retail projects. Specifically, the bill would permit sales tax increment financing (STIF) to be used for projects that have been approved by the state department of transportation but lack dedicated state funding to secure federal highway matching funds. The policy problems inherent in this bill are many. STIF is designed to subsidize retail projects, ignoring the fact that they are not a very effective form of economic development. Building new stores doesn’t grow the economy – it only shifts consumer spending from one place to another. Providing subsidies to move low-wage retail jobs around a metro area is a waste of taxpayer funds. The East-West Gateway Council of Governments (St. Louis metro region) found in its January 2011 study that the region had spent $4.6 billion subsidizing retail development between 1990 and 2007. During that period, 5,700 new retail jobs were created in the metro area, at an apparent cost of $370,000 per job. STIF makes a poor economic development tool for other reasons as well. Sales tax receipts are unpredictable, especially during leaner economic periods. Determining the value of the incremental increase in sales tax revenues is nearly impossible if assessors attempt to estimate how much retail spending is “new” and how much was merely cannibalized from nearby retail establishments. STIF also promotes the fiscalization of land use—the unwise practice of letting tax revenue considerations control planning decisions. California repealed STIF in 1993 to avoid this problem. Colorado’s proposal is worse because it would only subsidize new retail developments that rely on highway access, making it biased against existing retailers in urban centers. Another important consideration is that Colorado can’t afford to sacrifice the existing sales tax revenues that it would lose to STIF-subsidized development. As a TABOR (Taxpayer Bill of Rights) state, Colorado cannot raise new revenues without statewide voter approval. This is likely the reason that the development lobby is seeking this subsidy in the first place. As a result of the economic recession and TABOR, Colorado’s fiscal crisis is so dire that the state cannot afford to fund highway transportation projects despite the fact that federal matching funds are on the table. HB 1220 would sidestep the appropriations process for funding highway construction, shortchange the state’s sales tax revenue collection, subsidize the relocation of low-wage jobs in suburban fringe areas, and contribute to the growing list of dead malls in Colorado. Walmart’s U.S. operations deprive state and local governments of more than $400 million a year through a variety of tax avoidance schemes, according to a report released today by Good Jobs First, a non-profit, non-partisan research center based in Washington, DC. The report, Shifting the Burden for Vital Public Services, is available at no cost on the Good Jobs First website at www.goodjobsfirst.org. Shifting the Burden for Vital Public Services is a synopsis of a series of reports previously issued by Good Jobs First on Walmart’s practices regarding economic development subsidies, property taxes and sales taxes, along with a review of research on the company’s state corporate income tax avoidance. It also contains updated information on those practices. The study, “Fishing for Taxpayer Cash,” figures into a hot debate in Buffalo, where Bass Pro has been offered $35 million, as part of a $154 million overall project package, to build a store. The Erie Canal Harbor Development Corporation hopes the Bass Pro shop will anchor a comeback of an area in the noisy shadow of elevated Interstate 190 close to the shore of Lake Erie. Followers of Good Jobs know that we have long been critical of big-box subsidies like those to Wal-Mart and to mall giants like General Growth Properties, and we strongly recommend Stacy Mitchell’s seminal book Big-Box Swindle. And we have written articles in both progressive and conservative journals about the unusual subsidy dispute among top three outdoor sporting goods chains (Gander Mountain versus Bass Pro and Cabela’s). Thanks to the federal stimulus bill, a new tax-exempt bond has hit the market: “Recovery Zone Facility Bonds” (RZFBs). And while that phrase might make your eyes glaze over, keep reading, because initial indicators of how these bonds might be allocated in New York City are cause for heightened alert. RZFBs are a type of private activity bond that make commercial and industrial projects easier to finance because the bondholder does not have to pay federal, state, or local taxes on interest generated by the deal, and is thus willing to accept a lower interest rate. It’s difficult to evaluate the RZFB program so far because states across the country—including New York—are still grappling with how to take advantage of it. New York City is the exception. The Bloomberg Administration has started things off with a bang by selecting a controversial project in downtown Brooklyn called “City Point” to receive financing through these new bonds. If the deal goes down, City Point developer Albee LLC would receive $20 million in tax-free financing for a shopping mall that will likely be anchored by a big box store such as Target. This isn’t the first round of public money sought by this project—subsidies were approved in 2007, but then fell through due to difficulty in securing financing after the economic meltdown. Now, Albee LLC is looking to the stimulus bill for help. Advocacy groups on the ground, led by Families United for Racial and Economic Equality (FUREE), are experiencing déja-vu. Having resisted the 2007 deal, they will oppose this round of subsidies on many of the same grounds at a public hearing scheduled for September 10. But they will have plenty to beef about without reminding the city that the site was home to the old Albee Square Mall, which was demolished in 2007 to make way for City Point. That demolition displaced scores of longtime local business that catered mostly to Brooklyn’s black community. Those stores were at odds with the city’s vision of a newly gentrified downtown, which favors chains like H&M and Bed Bath and Beyond. None of the displaced businesses were given the option to return once the new facility is built, and no requirements for local hiring or living-wage jobs were tied to the 2007 deal, despite fervent protest. This history lesson should be the backdrop to the bigger question of whether retail development should ever receive public financing. Asking whether more Targets and Wal-Marts are really what so-called distressed communities really need is not a radical question at this point. It is well established that such economic development strategies amount to a subsidization of poverty, since retail jobs are among the lowest-paid. As an alternative, FUREE is pushing for an affordable grocery store in downtown Brooklyn, which is lacking in healthy food options. Good Jobs New York is keeping an eye on the City Point project, as more communities across the country recognize the dangers of subsidies for retail development, and are organizing to avoid them. There may be a bright spot to this story in the Bronx: The Kingsbridge Armory Redevelopment plan—also slated to receive public subsidies—is emerging as a model of how development in New York City might be done. Due to effective community organizing, Bronx Borough President Ruben Diaz recently announced his commitment to signing a Community Benefits Agreement with the developer that includes a living wage, local hiring and community space among a long list of points. So stay tuned! In a move rarely seen in The Bronx lately, an elected official is standing up for the creation of good jobs and accountable development. Newly elected Bronx Borough President Ruben Diaz Jr. has voted no on a land use proposal to build a subsidized mall inside the Kingsbridge Armory because the developer refused to sign a community benefits agreement. This must come as a shock to Related Companies, which plans to develop the mall and has gotten subsidies and sweetheart real estate deals from the city in the past. Related was awarded the contract to purchase the armory from the mayoral-controlled Economic Development Corporation for the bargain basement price of $5 million. The armory is a landmarked building that spans an entire city block, has a new roof, and is directly across the street from a subway and bus lines. The city seemed to move in the right direction in 2006 by involving community leaders in developing a Request for Proposal and including language that applicants supporting a living wage provision for the permanent jobs associated with the project will be viewed favorably. But after that the community hasn’t been involved. Diaz’s vote doesn’t mean the proposal can’t happen; the project now moves through the city’s 60-day labyrinthine land-use approval process that includes hearings and votes by the City Planning Commission and the City Council. If other elected officials follow Diaz’s lead, the city could leverage the subsidies to bring Related back to table with the community and still hammer out an agreement. For nearly a decade the Northwest Bronx Community and Clergy Coalition advocated for community use of the armory. In 2005 the group joined with the Retail, Wholesale, Department Store Union to create the Kingsbridge Armory Redevelopment Alliance (KARA), which called for a project that creates living wage jobs, promotes retail that doesn’t compete with long-time businesses and builds much-needed community, educational and recreational space for neighborhood youth. The Borough President’s stance comes not a moment too soon. Unfettered, subsidized development has grown rampant in The Bronx: Gateway Mall (developed by Related) near Yankee Stadium and the Water Filtration Plant have not brought promised jobs, have run far over budget and/or have moved forward in the land use process under the guise of fake Community Benefit Agreements. Kudos to Diaz for standing up for his constituents and hopefully setting a new standard that won’t allow subsidizing mega developments to come at the expense of locally owned stores and diminished wages, taxes and jobs.